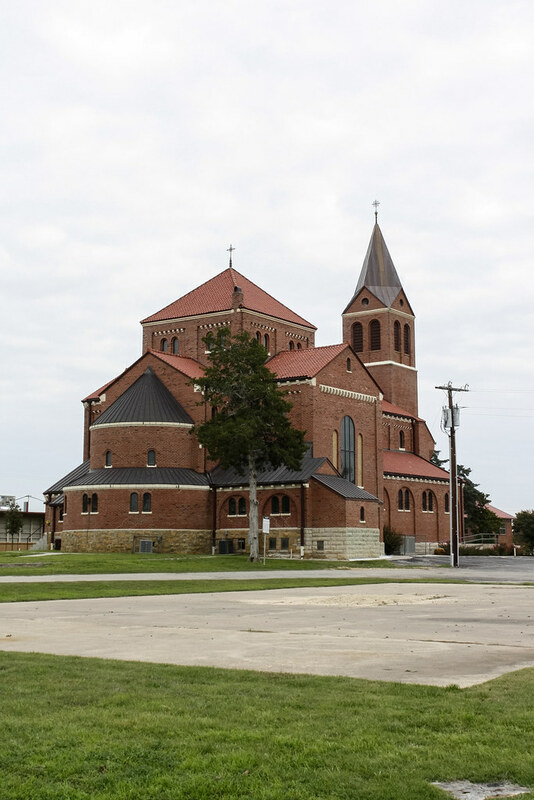 After the Texas Architects convention in Fort Worth, I took the opportunity to drive out to the small north Texas town of Lindsay for mass on Sunday morning. I had seen that the restoration of the Catholic church there had won a number of awards, and the few pictures available online looked fascinating. It was well worth the drive. 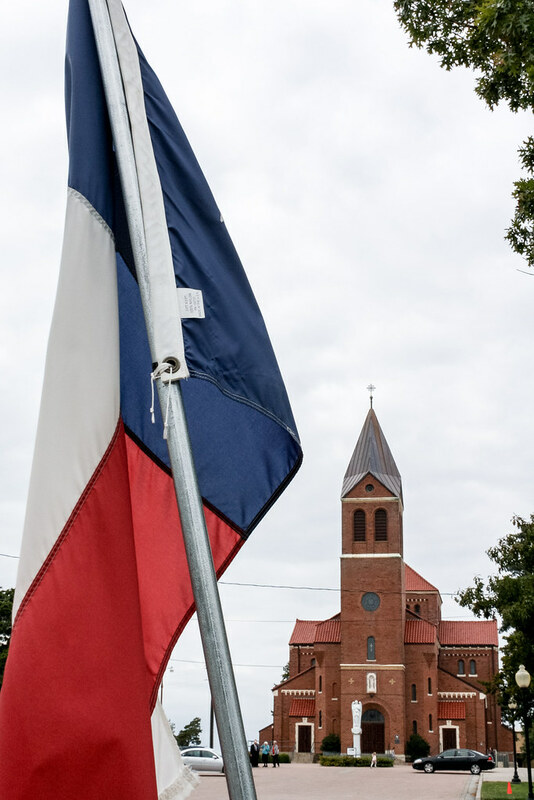 As German, Czech, and other Central European immigrants settled in small towns throughout Texas in the 19th century, they brought with them a particular image of a church. The limitations of frontier life, including a relative scarcity of materials and resources, made it impossible to recreate the elaborate edifices of their home countries, but in many of their new communities there developed a unique approach to church-building. 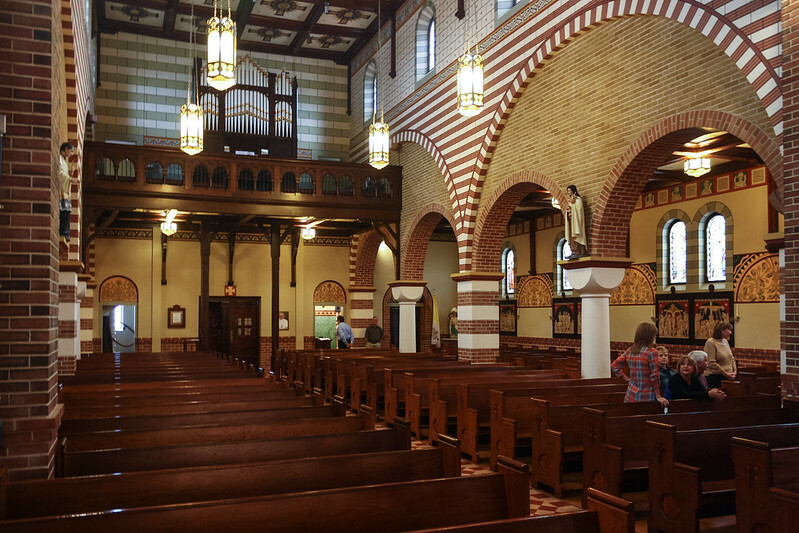 They borrowed from contemporary Gothic Revival churches and built a stripped-down interpretation of its essential forms in wood or simple brick. But it was on the interior of these churches that their builders fully expressed their vision. 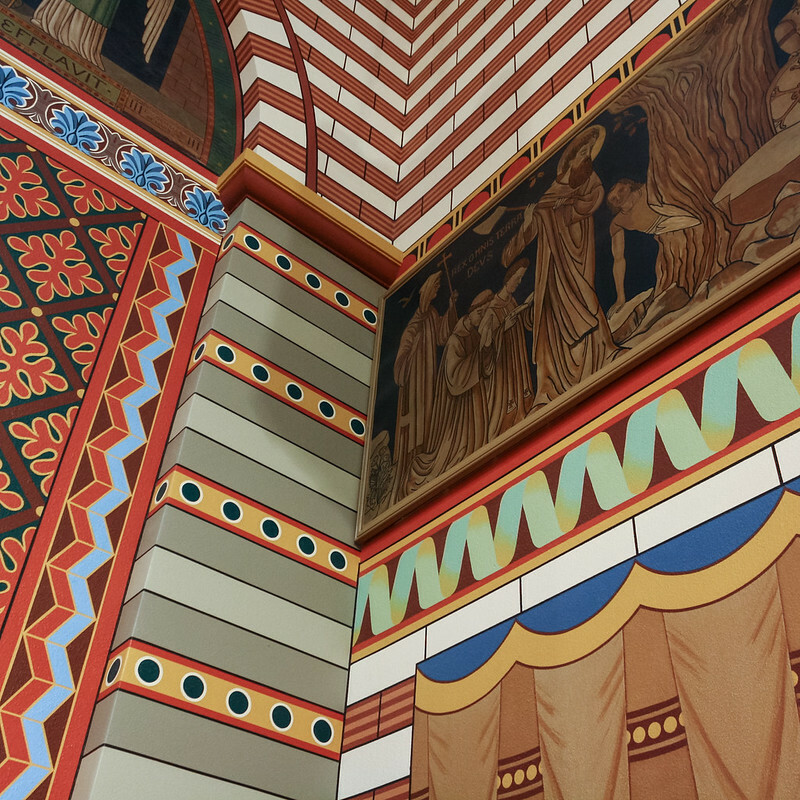 They covered the walls with elaborate painted ornament utilizing a wide variety of techniques ranging from figural religious imagery to abstract patterns and from architectural accents to trompe l'œil and marbling effects. 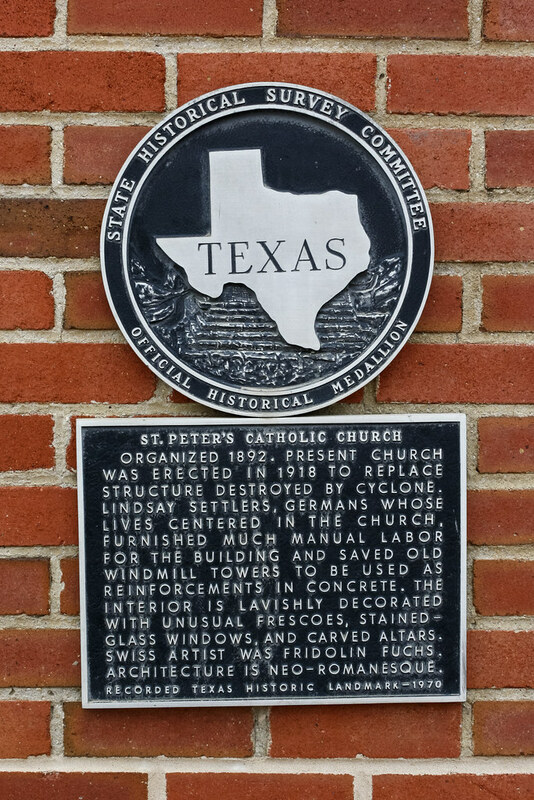 Collectively, these buildings are known as the the "Painted Churches" of Texas. 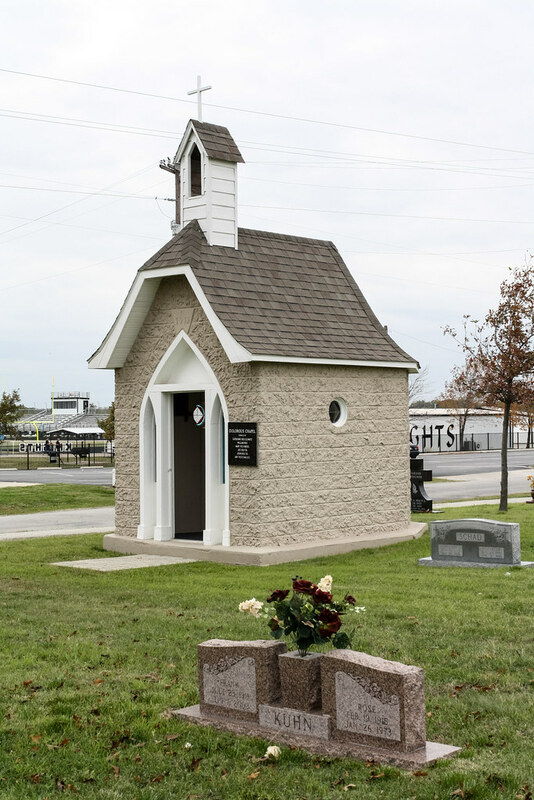 In 1983, the Painted Churches were nominated as a thematic collection to the National Register of Historic Places (Churches with Decorative Interior Painting TR), although the church in Lindsay had already been listed of its own merit in 1979 and by the state in 1970. I am working on plans to visit the other churches, so consider this the first in a series. St Peter, Lindsay is an outlier from the East Texas Painted Churches in a few regards. 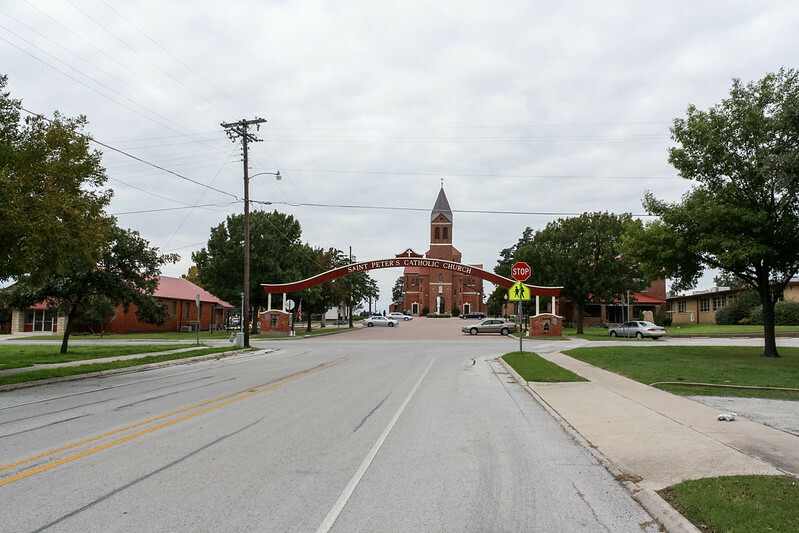 For one thing, it is located far from the concentration found in Fayette and Lavaca Counties. Whereas most of these churches are Carpenter Gothic structures, St Peter is a brick Romanesque basilica with Byzantine influences. The painting on the interior are more unified with the architecture than most of those in East Texas and the patterns are more abstract and geometric. 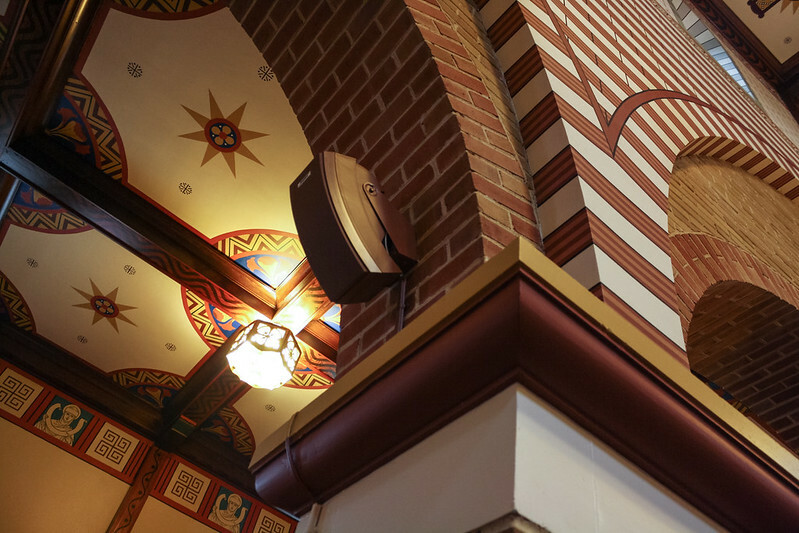 The result is a more unified whole wherein the exposed brick gives way to painted patterns based on the underlying building forms which in turn frame iconic symbols and figural canvases. All the more impressive is that it is a unity of diversity. A number of different painters executed the interior, with the figural components revealing the range of the different artists. 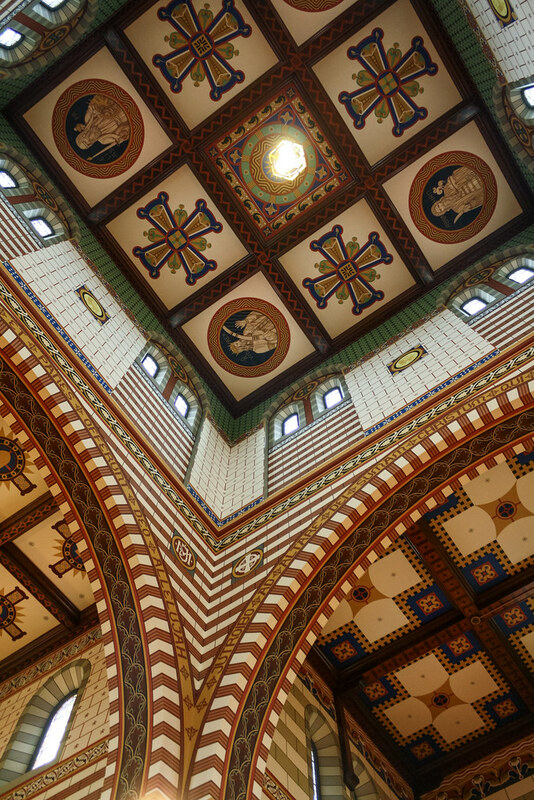 The Dutch architect Frank A. Ludewig (1863-1940) designed the current church built in 1917-1918. 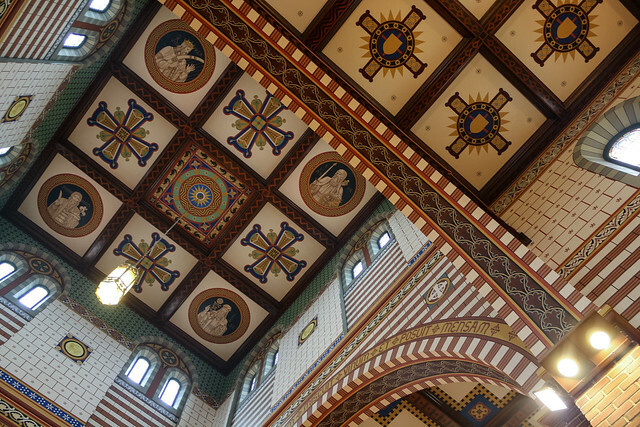 Ludewig studied at the TU Delft and worked in the office of PJH Cuypers, a Lay Dominican and the architect of the Amsterdam Central Station, the Rijksmuseum, and many churches throughout the Netherlands. 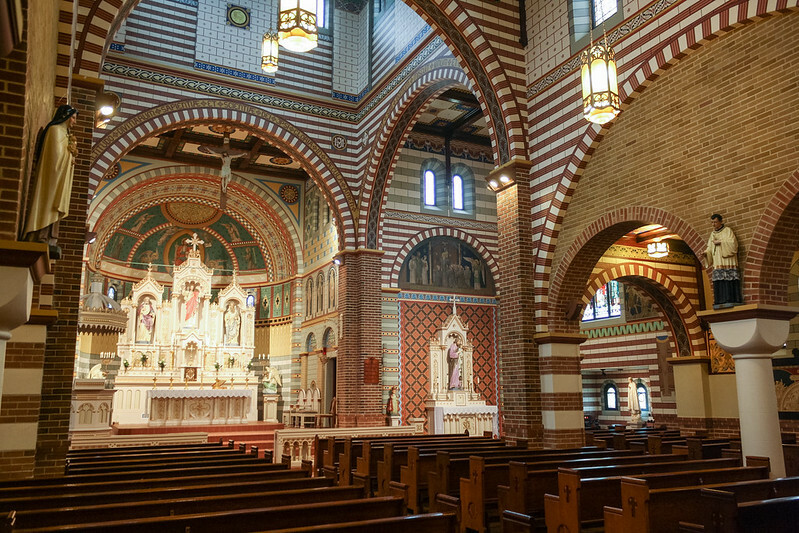 FA Ludewig moved to the United States in 1912 specifically to find greater opportunity to design church buildings. 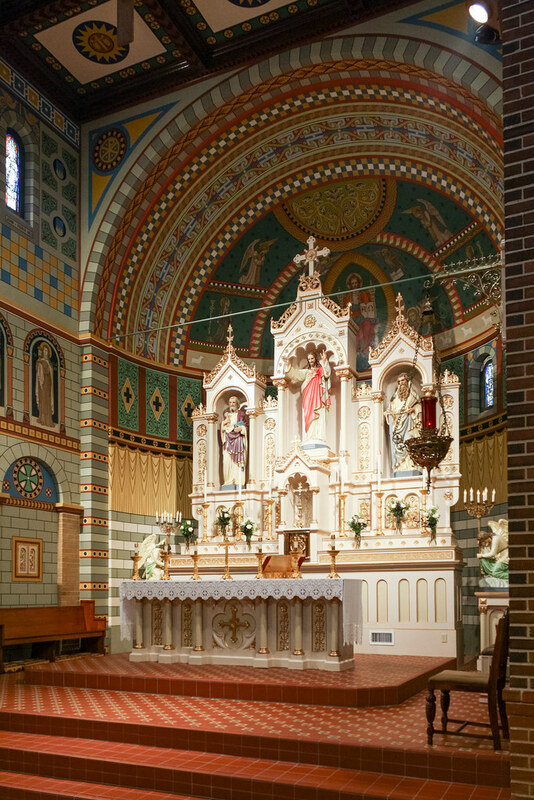 At the time of his work on St Peter, he practiced in St Louis and later moved to Holland, MI. His largest work in the US was the Pontifical College Josephinum in Colombus, Ohio. The exterior of the church closely resembles the Catholic church architecture of the Netherlands from this same time. The prismatic tower in particular has a Dutch flavor. 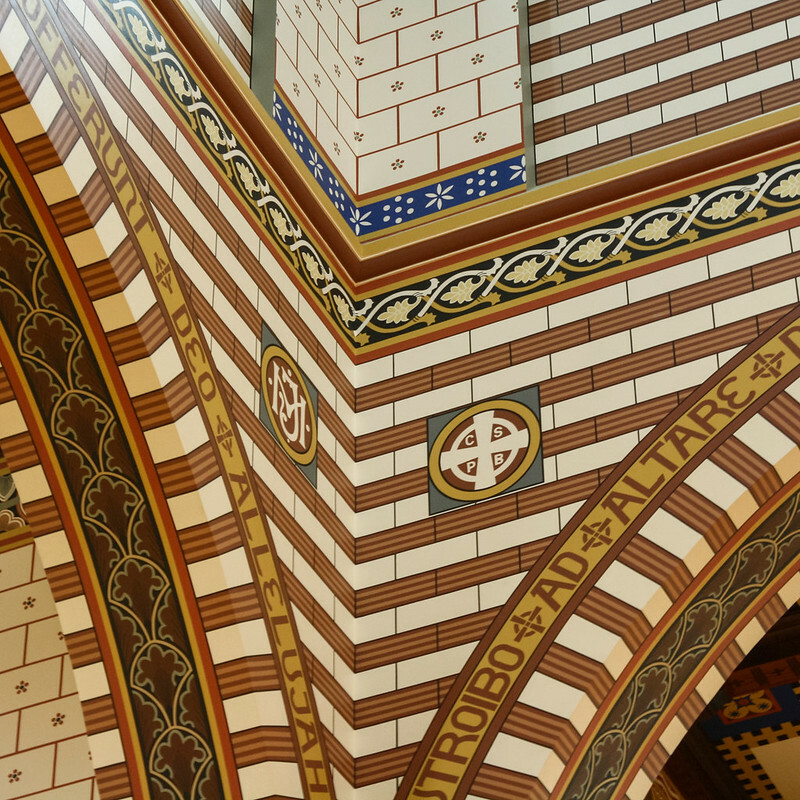 The design of St Peter takes a departure from the ornate Revivalism of Cuypers more towards the architecture of Hendrik Berlage who combined the combating rationalism and expressionism movements into a viable early modern architecture. Compare O.L. Vrouw Onbevlekt Ontvangen, Venlo, the last Gothic Revival church designed by PJH Cuypers, nearly concurrent with St Peter, Lindsay. 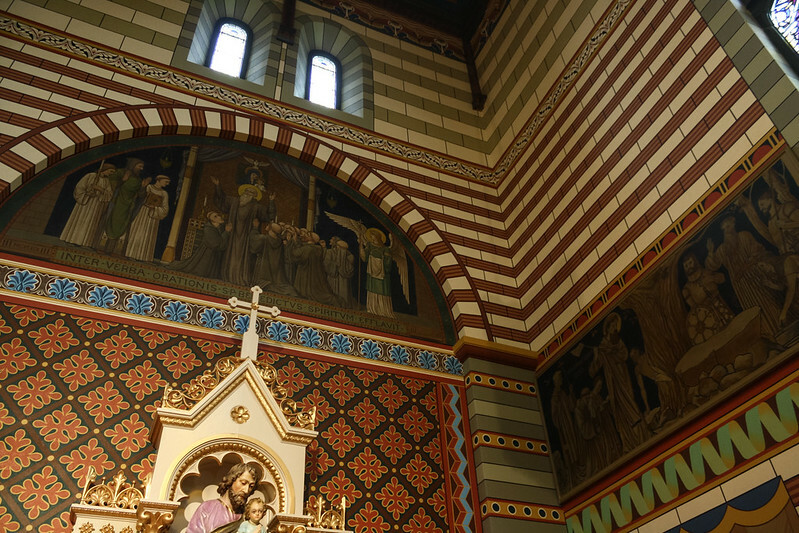 The bulk of the decorative painting is the work of the Swiss artist Friedolin Fuchs, who was also living in St Louis at the time. 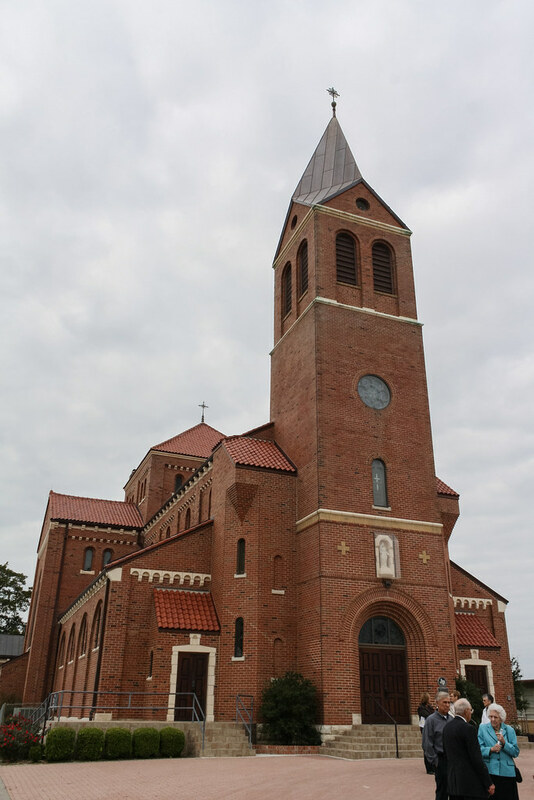 Fuchs similarly decorated a church in St Louis and the Benedictine Abbey in Subiaco, Arkansas prior to this project. 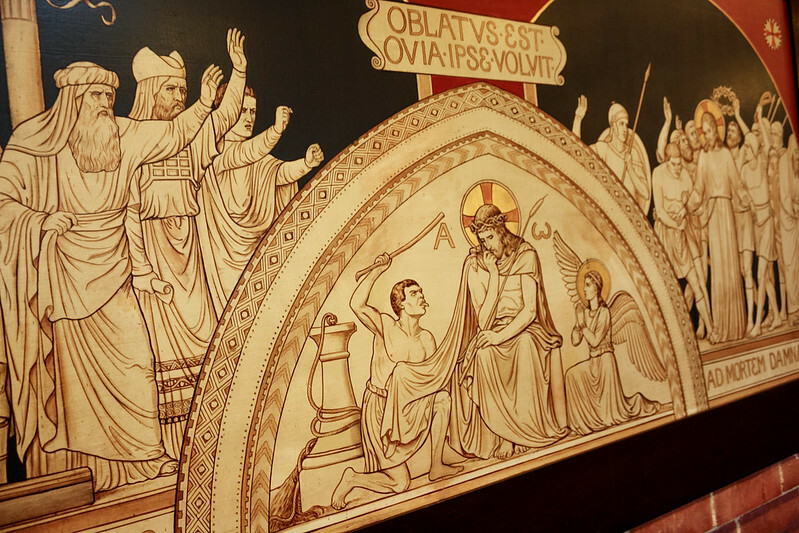 The six dark panels depicting events from the lives of St Benedict and St Boniface are the work of Dt Mathias Zell, the father of one of the former pastors of St Peter, Lindsay. The stations appear to be the work of a different artist, but I do not have any specific information on them. The altar piece stands out as somewhat incongruous with the whole of the interior. It is more Gothic in character and its figures are more romantically expressive than the abstract figures in the apse behind. As an object itself it does not share the directness of the craft of the structure itself; it has a fundamentally different basis for its structure and ornament that makes it seem a foreign object. With this altarpiece in place, it deviates from the sparse apses of early Roman basilica churches where the concavity of the apse and the mosaic treatment of its surface create a symbolic void. 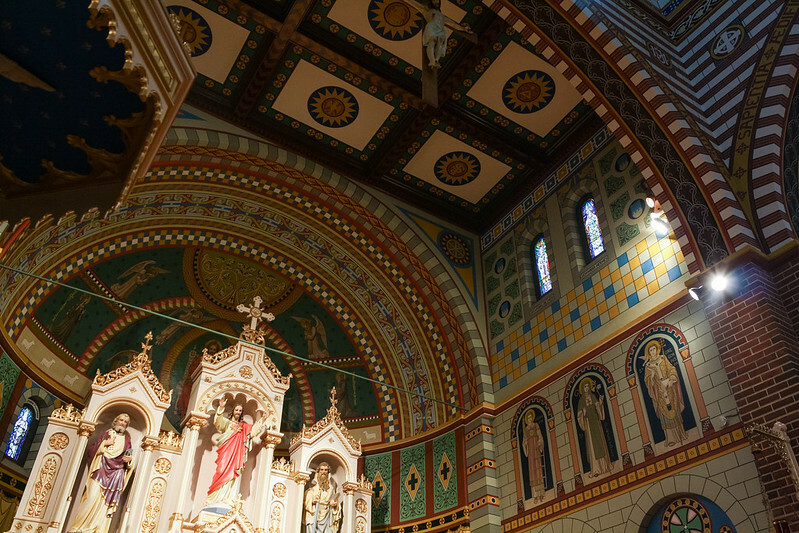 A spatial focus filled only with the celebration of the liturgy and its spatial throws of light and incense is more compelling than a focal object. Not that I would advocate removing the altarpiece, which is clearly part of the whole historical fabric. It would be interesting to know when it was added and whether or not it was part of the original design. The location of the church within the town, as the terminus of Main Street, shows its importance to the settlement. 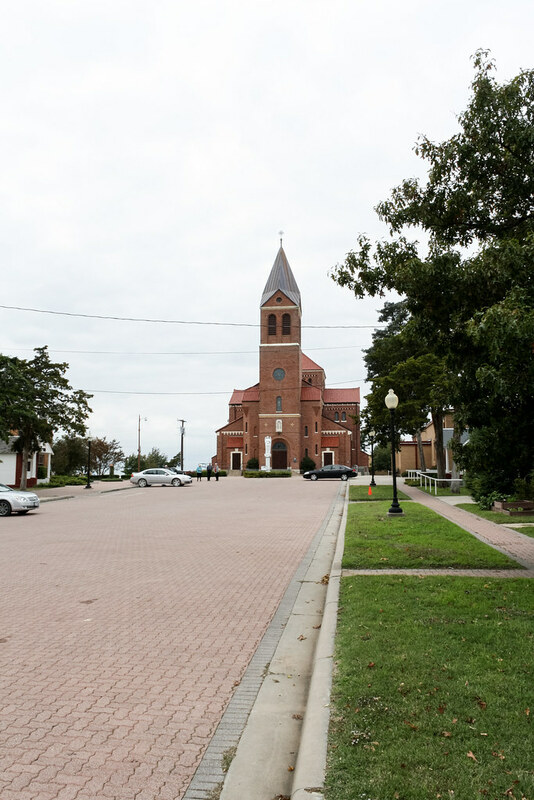 An entire block of Main Street forms a plaza between the entry gate and the church, with ancillary buildings on either side. 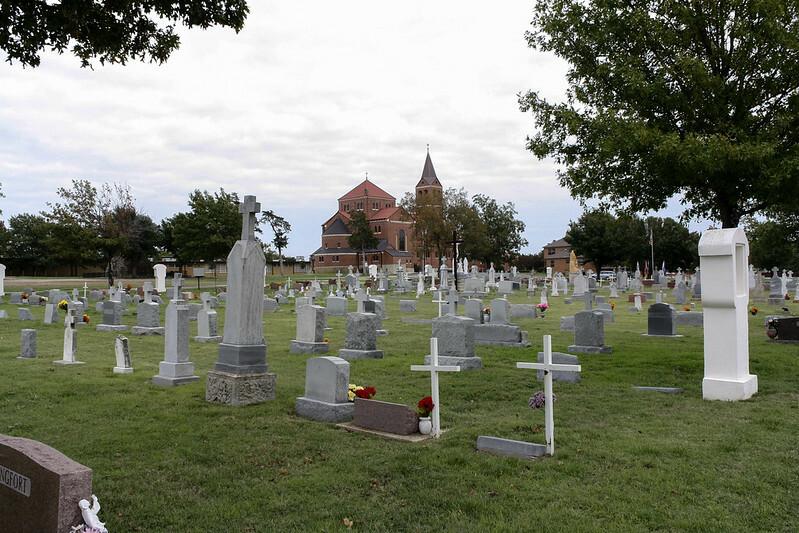 Behind the church is a large cemetery, still in use. Four chapels, two on the plaza and two within the cemetery, and a grotto round out the religious structures on the site. All five of these date from soon after the completion of the church and bear the names of the families who constructed them. You can find pictures of the other chapels and the remaining church photos in my flickr set of St Peter, Lindsay.